The Lotus Esprit Series 1 sports car. Whilst at the Turin Motor Show in 1971, Colin Chapman met the renowned car designer Giorgetto Giugiaro, who had previously designed the stylish mid-engined Maserati Bora, and who had set up his own design agency called Ital Design. It was agreed that he would create a concept sports car based on the then current Lotus Europa. Design work began in mid 1971. 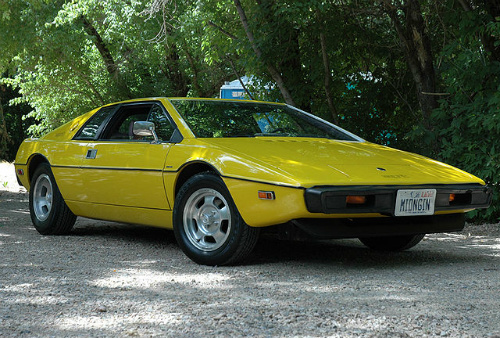 Designated the Esprit, the prototype made its debut at the Turin Motor Show in 1972, where it received universal acclaim. The track and wheelbase of the Europa twin cam chassis were increased to accommodate the 1973 cc, 16 valve, twin overhead cam, Lotus 907 engine. The unit was fitted with two twin choke Dell'Orto DHLA carburettors, and developed 160 bhp (140 bhp in the US export model), with a top speed of 124 mph, a 0-60 mph time of 8.4 secs, and an overall fuel consumption of 25 mpg. As with previous models, it had a glassfibre body, with the engine positioned longitudinally behind the passengers. The design of the car was a joint venture between Lotus and Ital Design. The first production prototype was available by Christmas 1974, when Lotus confirmed that the new car would be launched in 1975. Accordingly, the Esprit Series 1 sports car, also known as the Type 79, was launched in October 1975 at the Paris Motor Show, as a successor to the Europa. The new Lotus model was part of Lotus' family of two door sports cars, including the Eclat and forthcoming Elite, which epitomised Colin Chapman's vision of an upmarket production line completely devoid of kit cars. He felt this would also help the used Lotus market. The Series 1 embodied such features as racing suspension, a five speed Citroen Maserati gearbox, smooth body lines with no wings, and 70's interior styling. Although there was strong demand for the car, the Series 1 Esprit became renowned for poor reliability and quality which, sadly, was reminiscent of a number of previous models. At that time, to make matters worse, Lotus was involved in the ill fated Delorean project, which stretched production facilities, to the detriment of their own cars. The Series 1 differed from later versions of the car in that it had a shovel style front air dam, rear lights from the Fiat X19, Wolfrace alloy wheels, and a one piece instrument cluster. A promotional coup was the car's appearanace in a 1977 James Bond film in which it featured in a long chase sequence. The Europa was never considered a particularly attractive car, with a somewhat cramped cockpit, and was more a motoring machine rather than a passenger car. Since the Lotus 907 engine produced 140 ft/lbs of torque, it was clear that the Renault five speed gearbox, as used in the Europa, would not be strong enough. The solution was when Citroen offered its five speed, all synchromesh gearbox, as used in the Maserati Merak coupe. The independent front suspension was similar to that used in the Vauxhall Cavalier saloon, whilst the equivalent rear suspension was based on coil springs. It used rack and pinion steering, without power assistance, and four wheel, non servo, dual circuit Girling disc brakes. The interior layout was little changed, although there was much more room for passengers. However, entering and leaving the car was still a challenge. Unfortunately, the Esprit was still not available, as previously announced, in October 1975 due to a combination of financial restraints and the looming oil crisis. Nevertheless, production finally began in May 1976, and the initial output was disappointing in so much as the cars were not as fast, refined, or reliable as expected. By far the most important concern was the lack of refinement in regard to the engine noise being transmitted directly into the cockpit, which left an impression of harshness. In contrast, there were few that would argue with the car's good looks and handling abilities. The Esprit's target market was, of course, the US where exports began in 1977. The US version of the Lotus 907 engine, fitted with two Stromberg carburettors, easily satisfied emission control regulations such that its output was maintained at 140 bhp, giving the car a top speed of 120 mph. Esprit production experienced quite a boost after its launch in the US. In 1976, 138 units were built, with all but 4 going to the home market. In terms of Lotus models, the Series 1 Esprit is still in demand on the second hand market. In fact, as a used Lotus, it can sell for anything from £19,000 to about £25,000. However, this jumped to 580 in 1977, its best year, with 474 units being exported to the US. A total of 718 units of the Series 1 sports car were built. Nevertheless, criticism and negative press reports concerning the initial output of the Series 1 forced Lotus to rectify these defects, and improve the car. The result was the introduction of the Esprit Series 2 sports car in 1978. A 1976-78 Lotus Esprit Series 1 in good condition could fetch in the region of £20,000/$32,000.